“Mindy Kaling is my spirit animal.” These are words I’ve heard all too often when around good friends. While I wouldn’t go so far as to put Mindy at the top of my totem pole of spirituality—that spot’s currently occupied by Max Black (2 Broke Girls), though I’m also desperate to find a touch of Diane Lockhart (The Good Wife) in me somewhere—I will bow to the awesomeness of Ms. Kaling. Known for her roles as the quirky and ditzy Kelly Kapoor (The Office-US), and the equally fabulous Mindy Lahiri (The Mindy Project), it’s easy to see why there’s so much buzz surrounding the talented Emmy-nominated writer and actress. Like any other Mindy fan, I jumped at the opportunity to read her book, Is Everyone Hanging Out Without Me (And Other Concerns). And boy, was I glad I did. The book is every bit as witty and funny as Mindy is in every role she plays, including her cameo in the hilarious This is the End. I chuckled my way through the book, from her Introduction to her Goodbyes. 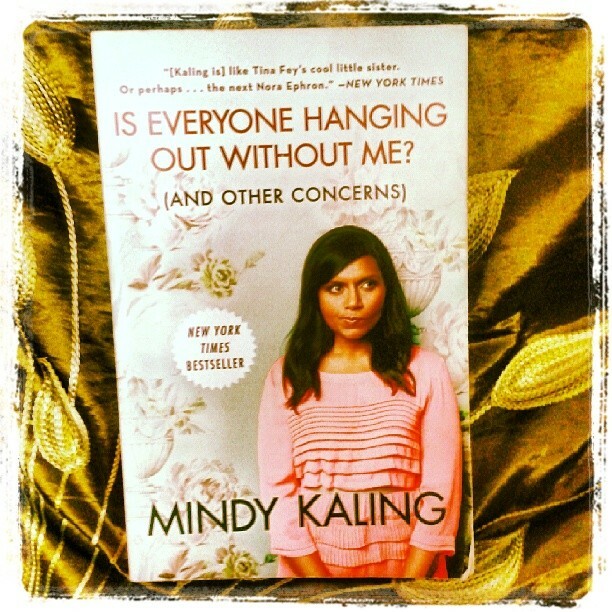 At the start of the book, Mindy Kaling answered a bunch of questions she felt readers may have regarding Is Everyone Hanging Out Without Me (And Other Concerns)—FAQ style. One of her proposed questions was why the book wasn’t as funny as Tina Fey’s book. Now, I won’t pretend to have read Bossypants, though I would love to. So I can’t really verify if this book really isn’t as good as Tina Fey’s offering—but then again, let’s face it… It’s Tina Fey! But I will reassure the reader that this book is every bit as good as Chelsea Handler’s Chelsea Chelsea Bang Bang—albeit definitely PG compared to Handler’s R-rated work. Now, I’m one of those people who thoroughly enjoy a heavy dose of raunchiness, but what this book lacks in raunch, it makes up for in en-pointe humor designed for the every girl. Another chapter in the book talks about a recent photoshoot Mindy had with close buddy and co-star Ellie Kemper. In this chapter, the comedian talks about the difficulties stylists seemed to have with her fuller figure. During the photoshoot, the stylist thought to bring dozens of gorgeous samples, all of which were a size zero, except for a shapeless navy shift. Feeling sorry for herself, she ducked into a bathroom, only to find words of wisdom offered by some angry student under a bit of poo smeared on the walls. Armed with a newfound take on her situation, Mindy marched up to the stylist and had one of the size zero gowns “fixed” so she could wear it for the shoot. I’ve seen the photos, and Mindy and Ellie look amazing! Other chapters I loved in Is Everyone Hanging Out Without Me (And Other Concerns) include I Love Irish Exits—where she has convinced me that an Irish Exit is, at least, more considerate than its French counterpart, Why Do Men Put On Their Shoes So Slowly—truth! Why do they take forever with their shoes?, Types of Women in Romantic Comedies Who are Not Real, and Roasts are Terrible. All in all, I found Is Everyone Hanging Out Without Me (And Other Concerns) an amusing and somewhat eye-opening read. Mindy Kaling has a knack for philosophizing the everyday and finding something witty to share with her readers/audience. While it isn’t exactly laugh-out-loud funny, at least not for this particular reader, it does elicit its fair share of chortles and snickers. And most of all, it’s very well-written. Now, as stated earlier, I’m a Mindy fan—and proud of it—and this book just solidified that fact.